We’ve all been there, and this year the students at The Friedman Sprout joined together to make moving to Boston a little easier for the incoming students. In this article we’ll introduce you to the Massachusetts Bay Transportation Authority (the MBTA or T as the subway and bus system is commonly known), the excellent neighborhoods in and around Boston, and give you some handy, all-purpose tips for transitioning to life as a Bostonian. Most students find housing through Craig’s List (http://boston.craigslist.org/). This seems to be the best option for finding shared living situations. If you’re concerned about picking a place without visiting it first, try contacting Matt Hast in the Office of Student Affairs. In the past he has connected incoming students looking for housing with current students who have space where they can sublet or couch surf until they find the apartment of their dreams. Also, be sure to check out the roommate and subletting section of this month’s Sprout. Having access to a car is a nice perk but not a necessity. In certain areas (Somerville and Cambridge spring to mind) parking tickets seem to be the main source of income for the city police. In other areas such as down town Boston, parking can be such a bear that a car is more trouble than it’s worth. If you’re worried about being entirely dependent on public transportation, Zipcar is a great option for those occasional trips requiring a vehicle. Plus, Tufts students get a discount rate! Another option if you don’t want to worry about public transportation or a car is living close to school. For Friedman students that means the South End. Click here to read more about South End living. The T has many faces: buses, subway, light rail, commuter rail, and ferries. However, the groupings aren’t as neat as they might first seem. For example, the Green Line sometimes operates like a subway train and at other times operates like a bus, while the Silver Line is a bus that runs underground and operates like a subway train. All the MBTA services can be used with a Charlie Ticket (a reusable pass with a magnetic strip) or Charlie Card (a plastic card with an RFID chip in it), available for purchase at a discount rate through the school or for standard rates at most subway stations. A “linkpass,” which covers service on Boston area buses and subways and costs $59 per month without a discount, tends to be sufficient for Friedman students. The Buses: While not as fast or as warm as the subway, the Boston bus system can certainly get you where you need to go. In fact, some neighborhoods in Boston are out of the reach of the subway and can be reached only by car or bus (click here to read more about Union Square, one of the more popular neighborhoods with bus-only transportation). There are over 150 bus routes in the Greater Boston Area. With so many bus routes it can be hard to know which bus will take you where. Fortunately, the MBTA website has a handy “trip planner” that can help you. The Subway: The T has traditional subway lines–the Red, Green, Orange, and Blue–as well as an underground bus known as the Silver Line. Most Friedman students choose to live on the Red and Orange Lines, with a smattering of students in neighborhoods serviced by the Green and Silver Lines. The Red and Orange Lines are considered to be the fastest and more reliable subway lines. Green Line riders, especially those who live on the infamous B Train’s route, frequently complain about slow service and long waits. Below is an overview of the three subway lines most frequently used by Friedman Students. The Red Line: If you haven’t been to Boston before, consider the red line your one-stop-shop for all your living, entertainment, and academic needs. The Red Line extends from Alewife to JFK/UMass, where it then splits and continues to either Braintree or Ashmont. However, few people ever ride the entire length of the red line, due to the many attractions along the way. The red line encompasses all the fun of city life, but includes enough housing and small shops that you don’t feel like you’re living in Times Square. The stops are approximately two minutes apart , and a walk-able distance from one another. The following is a sequential glance of the portion of the red line most frequently habited by Friedman Students, from Alewife to South Station. On the T, this ride should only last about 30 minutes. With a good book, newspaper, or friend, this underground journey might even be one of the better parts of your day! We will begin with Alewife, the first (or last, depending on where you start) stop on the red line. Alewife (is in easy walking distance from a) TJMaxx, Whole Foods, Trader Joe’s, Staples, and even an athletic store and cheap movie theater. The housing is a mix of low-budget high-rises to multifamily homes. Click here for information on living in Alewife. The next stop from Alewife is Davis Square, home of Tuft’s University’s undergraduate campus, and a melting pot of restaurants, bars, and convenience stores. Davis Square is where many students (Tufts, Harvard, and MIT) choose to live, for a number of reasons. Click here for information on living in Davis Square or Teele Square. Porter, Harvard, and Central Square are the next three stops on the red line and are all very close to each other in proximity as well as likeness. Unlike Davis Square, these stops are close to Mass. Ave—a major street that takes you anywhere in Boston via car (or bus). These areas are not only easily accessible via car, subway, and bus, but they also have fun shops, bars, and restaurants to keep you busy during your free time. As you travel further along the red line, the stops become mostly urban and higher end apartment buildings. The next stop, Kendall/MIT, hosts the famed Mass Institute of Technology, as well as some hotels and businesses. The houses in Kendall are mostly for families or business-people. This is similar for Charles/MGH. Although the stop is the most beautiful one on the red line (overlooking the Charles River), it is mostly higher end apartment buildings and medical buildings. Park Street is the crux of the T and Boston. Here, you can transfer to the green line, or get off and enjoy Boston Commons park, city life, and a number of city universities like Emerson and Suffolk. Housing is higher end apartments and lofts (mostly green line territory). Park Street is close to Newbury Street, the best place in Boston for expensive shopping and designer boutiques. Downtown Crossing is the typical stop along the red line for Friedman students. Although, in order to get to the school, you must first walk through the shopping district, clouds of cigarette smoke, and smelly restaurants. This is also Boston’s China Town; you can find anything here from delicious bubble tea to duck beaks. Few people live here other than the owners of said restaurants. The final stop on our journey is South Station. For all intents and purposes, this stop is a travel Mecca. Here, you can connect to the silver line which will take you to the airport. Or stay inside and grab a train or bus to prett y much anywhere. South Station is also in the heart of the business/financial district. The Orange Line: The Orange Line covers the most ground of any MBTA subway line, going from Oak Grove in Malden all the way to Forest Hills in Jamaica Plain, a distance of 14 miles. A few students who live on the Orange Line choose on the northern section, near Sullivan Square. However, the journey down the Orange Line gets more interesting the further south you go. North Station is a major stop for the commuter rail with trains going from there to Fitchburg, Haverhill (pronounced Hay-vrill), Lowell, and Newburyport. If you’re interested in touring farms on the North Shore but lack a car, North Station is the T stop for you. Haymarket is the known throughout the Greater Boston Area for its open air market and as the best place to get amazing discounts on produce. Nestled amid historic Fanueil Hall, the deliciously Italian North End, and the buttoned up Government Center, Haymarket it the place to be in summer. Stop by for sightseeing and leave with enough veggies to last you all week without breaking your pint-sized grad-school piggy bank. Downtown Crossing, Chinatown, and Tufts Medical Center stops are all within walking distance of the Friedman School’s Boston campus. Luckily, for students living on the Orange Line, you only have to walk outside in the bitterly cold Boston air for 3 blocks to get from the Tufts Medical Center stop to Jaharis. Back Bay and Mass Ave aren’t stops you’re likely to find fellow Tufts students living near. The areas are notoriously expensive. They feature the historic Beacon Hill and are close to the upscale shopping districts of Newbury Street and Copley Place. While you may not want to live here, it’s certainly a fun place to visit and have a cup of coffee while doing readings for Public Policy. The final destination of the Orange Line is southern section of JP. While JP starts with Ruggles station, Friedman students tends to cluster at the Jackson Square, Stony Brook, and Green Street stops. This thriving area is low cost and high culture and an incredibly fun place to live. Click here to read more about living in JP. The Green Line: This line is the oldest, strangest, and most tempermental of all the T subway lines. While the Orange Line gives you a straight shot from north to south and the Red Line branches one time at most, the Green line has four separate “westbound” trains to choose from. 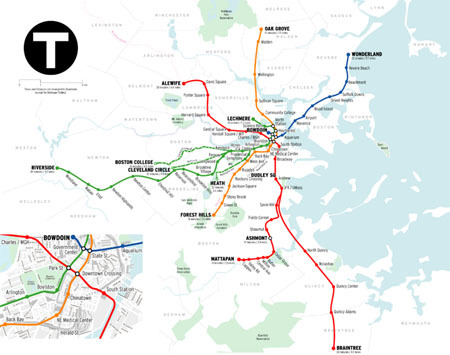 Students who live on the Green Line tend to live in the western section of it, so knowing the difference between the Heath Street E Train and the Boston College B Train can be pretty important. The B Train branches off at Kenmore Station and travels through Brighton, past Boston University, and on to Boston College. Not many Friedman students live on the B Train’s route, although some of them are seduced by the low rents that can be found in Brighton. The B Train is notorious for being slow, ill timed, and going “express” when you least want it to. Click here to read more about living in Brighton. The C Train has a better rep than the B Train and takes you through scenic Brookline towards Cleveland Circle. Despite the similar names, Brookline and Brighton have very little in common. Brookline is a pleasant, upscale city full of parks, shops, cafes, and families. Not many Friedman students can find rents that suite them in Brookline, but those who do tend to stick around. Click here to read more about living in Brookline. The D Train (also called Riverside, which sort of wrecks the ABC theme) goes through a more southern section of Brookline, but first travels through some of Boston and stops at historic Fenway Park before continuing on to Newton. Because the D Train is the newest Train to be added to the Green Line it tends to have the most modern and well engineered stops and the fewest problems of all the Green Line branches. The E Train is confusingly called both the Heath Street Train and the Arborway Train. This confusion is due to the fact that in 1985 train service was “temporarily” suspended to the Arborway stop. Unfortunately this “temporary” suspension continues to this day and the train currently only runs as far as the Heath Street stop, hence the dual names. Unlike the other three Green Line Trains, this one branches off at Copley Station, two stops before the others. Most students have nothing to do with the E Train of the Green Line, but for students who intern at Brigham and Womens Hospital it can be helpful. Hopefully this article has shed some light on places to live in Boston and ways to get around. However, if you still feel overwhelmed remember that you can always contact the helpful folks at the Office of Student Affairs for more information.